This plant has invaded many areas in the Mt. Veeder Watershed, including road sides, and is a significant fire hazard. This plant is showing up in many places in the Mt Veeder Watershed forest and is choking out native plants. Help stop the spread of this pernicious plant in our watershed. Another highly invasive thistle that needs to be eradicated. At least one homeowner on Mt. Veeder has an infestation of this plant. Each plant creates about 200,000 seeds and seed life is estimated to be between 35-100 years. The plant is highly adapted to the dry summer conditions of our watershed. 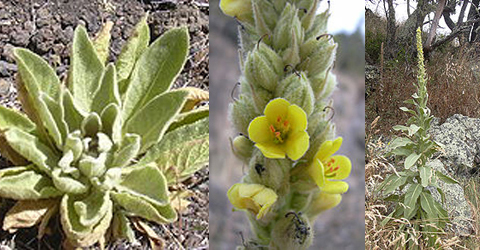 In addition to crowding out native plants, Common Mullein harbors pests that attack agricultural crops. This hardy vine is spreading rapidly in California, and is infesting more and more of the Mt. Veeder/Dry Creek area. The plant disrupts and overtakes native species and communities. Riparian zones are particularly at risk. Pieces of the vines break off and wash downstream and start new invasions. When working on eradicating the plant, start in the riparian zone and work backwards. Be sure to dispose of the plant in a compost pile or yard waste bin to prevent resprouting.